I wish I saw what Jay was working on, and would have taken a picture of that.. 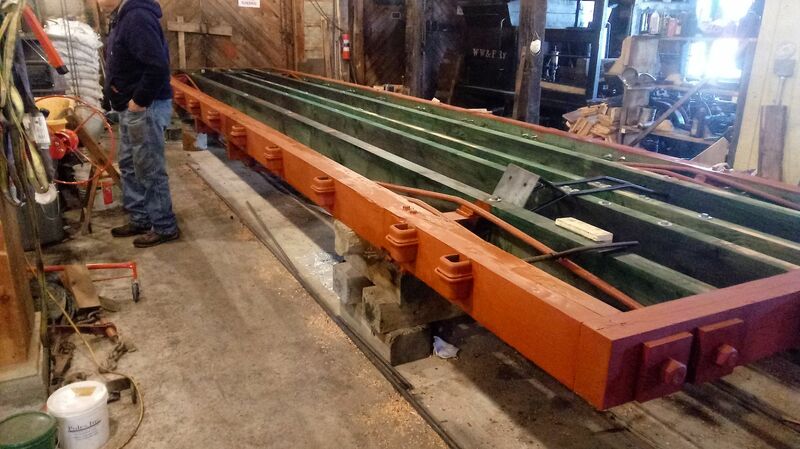 I am impressed with how quickly the flatcar is coming together. Who had the honor of treating the sills? Fred was in last Sunday and did a lot of the copper napth (the green, abbreviated because the real word is way too long for me to remember) and finished it during the week, and Start did the priming. Love to see Zack's work come together. Can't believe its going so fast. When do we start the next one? Al also did copper nap. Fred, it seems like you and Al are becoming the experts on copper nap application. 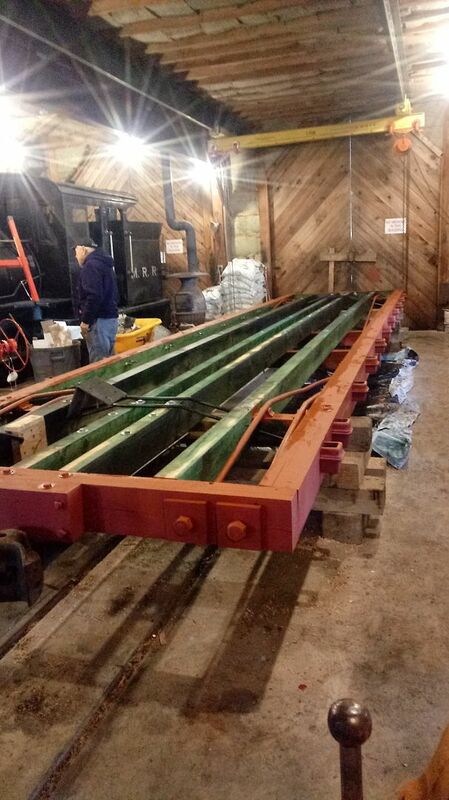 What is left to do on the flatcar? Besides trucks, decking, couplers and brakes. Brian, Couplers were mounted on the car frame while frame was upside down. Only knuckles need to be installed. The brake wheel will be installed. Deck planks may need painting or wood treatment. Trucks. The B&SR marked trucks from box car 57 will go under B&SR flat car 34. At some point in time the B&SR marked trucks under museum built flat car 126 will go under Box car 57. 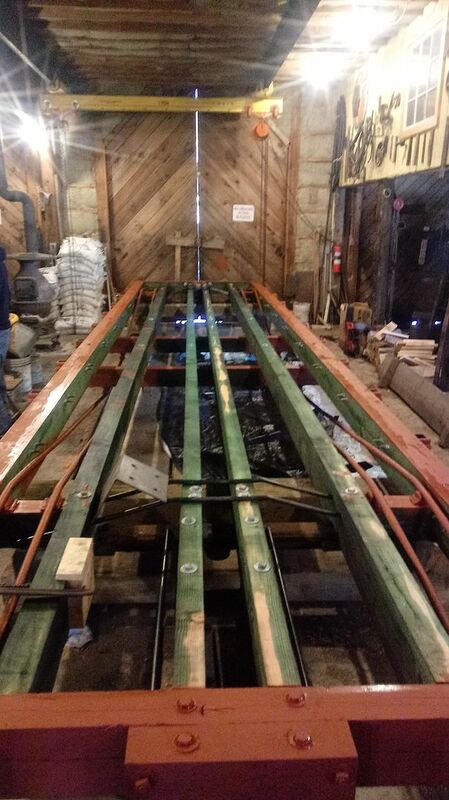 Car 126 when built by museum, was built with bigger size timbers than car 119. Museum wants to build a new pair of heavy duty trucks for flat car 126.
oh, last i saw there was only draft gear on the car. Super cool to see it moving along. Any idea how much longer till we have a functional flatcar? maybe the last picture wasn't detailed enough but I didn't see any buffer springs in the draft gear box. Am I blind? lets test to see if you are blind, how many fingers am i holding up? Hey guys I have a question, is the milk car 65 back at WW&F for winter storage or is it not there this year? 65 never made it back to Sheepscot, it's still in Wiscasset. It may need to return at some point, as Maine DOT is doing some reconfiguring work in the area this year.